October 15, 2013 – The two-of-a-kind Master Distillers’ Unity Bourbon created to help raise money for the ALS Association’s “Parker Beam’s Promise of Hope Fund” sold for $10,115 (including bidder’s premium) at Bonhams in New York City during Sunday’s auction of rare whiskies and other spirits. An anonymous bidder won the auction for the two-bottle set, which includes whiskies from seven of Kentucky’s largest Bourbon distilleries and was blended by Heaven Hill Master Distiller Parker Beam. Beam was diagnosed with ALS earlier this year, and his fellow master distillers at Jim Beam, Maker’s Mark, Buffalo Trace, Four Roses, Wild Turkey, and Woodford Reserve donated whiskies for the bottling, which Parker created with the addition of his own whiskey from the Heaven Hill stockpiles. 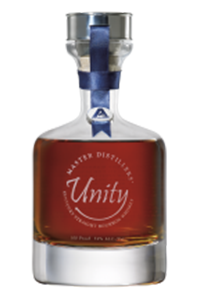 The result was 12 bottles of Master Distillers’ Unity, 10 of which were poured the day before the auction during WhiskyFest New York for a special toast to Parker. The remaining two bottles are said to be among the rarest Bourbons ever produced. Heaven Hill’s Shapira family created the Promise of Hope Fund after Parker’s diagnoses, and pledged to raise at least $250,000 for the ALS Association through donations from sales of this year’s Parker’s Heritage Collection “Promise of Hope” Bourbon. Other rare whiskies bringing high bids during the Bonhams auction included a 1946 Macallan Select Reserve that went for $8,925, a bottle of Old Vatted Glenlivet circa 1862 that sold for $7,735, and a bottle of Aberlour-Glenlivet from President John F. Kennedy’s collection that was given as a gift to a friend that sold for $6,545.